Holiday.gr - Exabela, a trip to a myth! 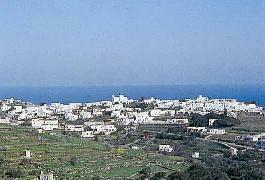 Exabela is a rural village, 2km southeastern of Apollonia, on the road to Faros. In its entrance are Arades that impress every visitor. It is a row of ten windmills. Some of them are deserted, others in good condition, while there are some turned into residences. Walking in the narrow paths you will be impressed by the folkloric architecture. The known feature of Cyclades islands impresses every visitor, as the many churches with important icons. Among them distinguish the old church of ‘Geros”, as the locals call the oldest church of Saint Nikolaos to discriminate it from the newer parish church of the Saint. Inside the church of “Geros” is the grave of poet Aristomenis Provelegios, who was born in Exabela. It is worth visiting the monastery of Panagia Vrisiani built during the 16th century, one of the most important religious monuments of the island. Distinguishes for its wooden chancel screen, rare icons and remarkable frescoes. Exabela is the homeland of the famous cook Nikolaos Tselementes. As for your accommodation you will find rooms to let. In the taverns of the village taste the traditional revithada and the authentic recipes of N. Tselementes. Been to Exabela ? Share your experiences!